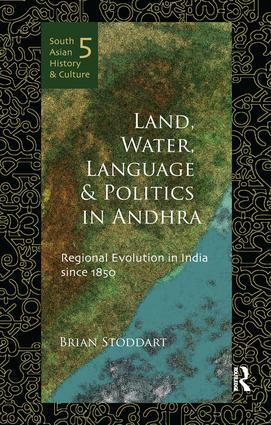 This book explains how access to and use of land, water and language helped shape Andhra politics in India from 1850 down to the present day. After independence, the debate over land reform and policies on irrigation has shaped the fortunes of various governments, while the debate over the make-up of the language-based state has stimulated separatist movements like the one in support of Telangana. The book discusses how British innovations in irrigation in coastal Andhra in the mid-nineteenth century transformed the economy there from food crops to cash crops, and created new markets for local entrepreneurs. This stimulated increased education and social reform in the region, which in turn supported new politics in search of constitutional concessions. The drive for a Telugu language-based province then arose in concert, and those political resources were then used to determine local patterns down to independence. The 1930s ruse of the socialists, then the communist organisations, was an extension of land and water tax debates, which impacted the political nature of development — both before and after — independence. This is one of the first books on Andhra that recounts this story and is based on extensive archival research exploring the deep relationships between land, water, language and politics. It would be of primary interest to those studying modern nationalism in India, natural resource management, Indian politics and economic growth.